The first time I saw this at 7-11, I immediately blurted out “60 pesos?! Grabe namang mahal ng ice cream na yan” and the two girls behind me proceeded to get two of those – each – and pay for them. I just watched in awe. Who in their right mind would pay 60 bucks for a small ice cream, right? Well, ladies and gents, for the love of curiosity, I did. I first tried the Classic variation. 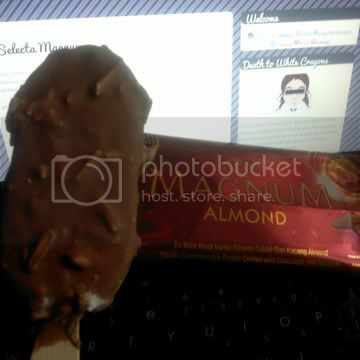 It’s small, but slightly thicker than most popsicle. Vanilla ice cream was coated with chocolate, which I am guessing is the Belgian part. 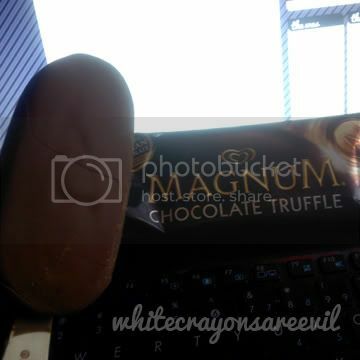 I only recognize white chocolate and dark chocolate as the types of chocolates since I’m not really into chocolates. 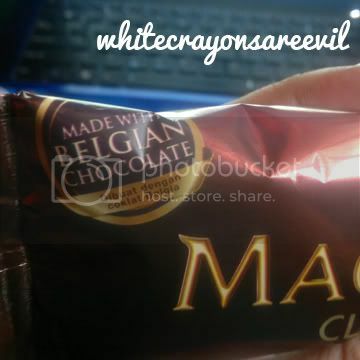 If this IS Belgian chocolate, it tasted… underwhelming. Sure it was creamy, but, you know,because of the price I was expecting a little extra umph, but got none. The vanilla ice cream was a notch creamier than, say, the cornetto ice cream, but my eyes also didn’t sparkle like a cartoon after I ate it. Ditto to the things I said in Classic *look up*, but this time, add some almonds in the chocolate layer. I would suggest you get this instead of the classics, unless you don’t like almonds or are allergic to it. Well, if you’re not into vanilla ice cream, you’ll like this better than the first two. 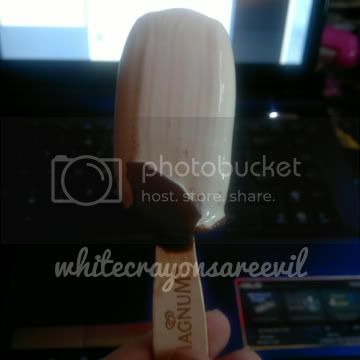 Since I LOVE vanilla ice cream, this one just made me very umay. 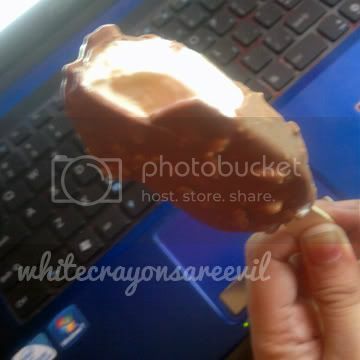 The same chocolate coating as the Classic, but instead of vanilla ice cream, you have a chocolate ice cream. Double chocolate. chocolate chocolate. Of course, a lot of people would prolly love this, but again, the chocolate ice cream was just ok.
Here’s a summary: are they delicious? Yes. Like every other ice cream on this planet. I am a total ice cream freak, btw. But were they worth the price? No. 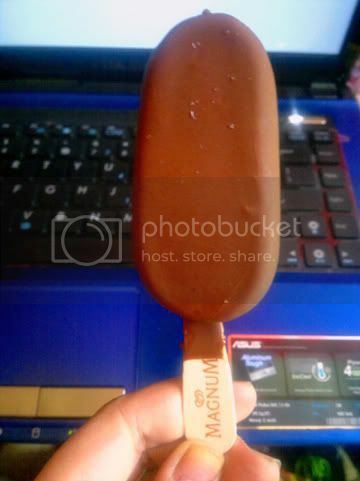 Magnum is just a very over-priced, over-hyped ice cream which has a good marketing strategy via social media. End. 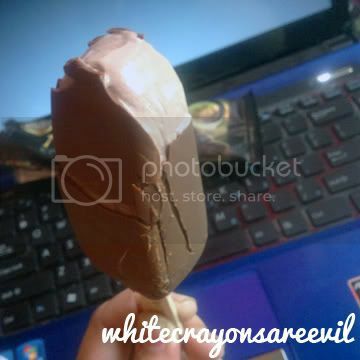 While we’re on the topic of ice creams, might I suggest to you Cornetto’s White Chocolate. That food is making me happy so much. 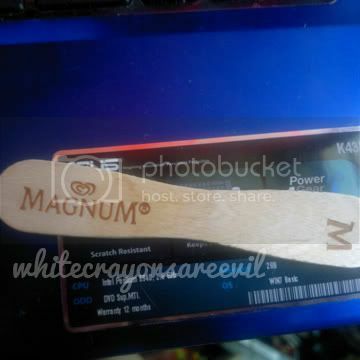 I think the makers, or whoever brought Magnum to PH hired a couple or three celebrities to endorse the ice cream – all of them are pretty popular in social media, specially twitter. Maybe that’s why it’s been trending like crazy. on a side comment, on of this celebrities, or two… can’t remember, mentioned *read this with a very cono voice, ok? 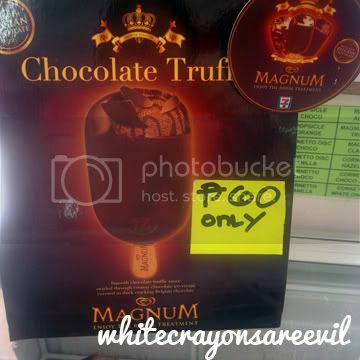 * “Magnum is here in PH blah blah blah and it’s only 50 pesos! wow what a steal blah blah blah. ok, first of all, in 7-11 it’s 60 pesos, and 55 in ministop. second of all, it’s not only 50 pesos, it IS 50 pesos. 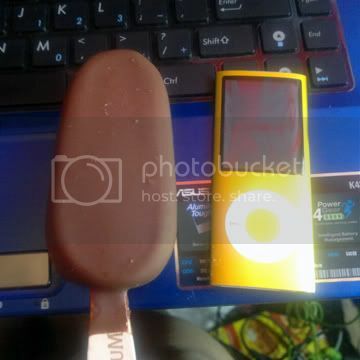 50 pesos is NOT cheap for a stick of ice cream, except if it’s made up of some kindov gold. In this case, it wasn’t. Still, people are buying them.